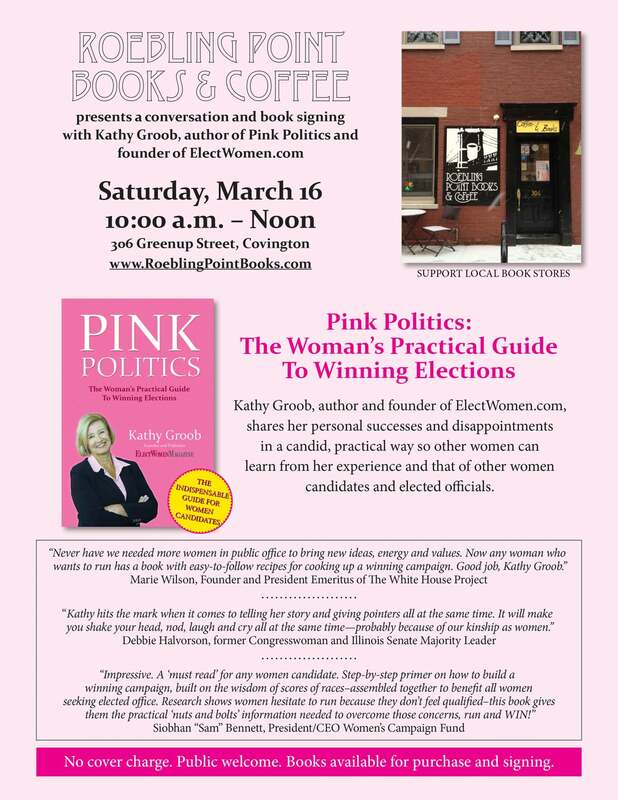 Covington, KY—After holding over 20 book signings across the country for her book Pink Politics, Covington Author Kathy Groob is holding a book event in her hometown next weekend at Roebling Point Books & Coffee on Saturday morning, March 16, 2013 from 10 a.m. until noon. Groob will be signing books and holding a discussion about what is happening on the national level to elect more women to public office. Click here for more details about the event. Kathy Groob launched her PINK POLITICS book tour in 2012. In this book PINK POLITICS – The Woman’s Practical Guide to Winning Elections, Groob tells of her own experiences as a candidate and offers women a realistic assessment of what it takes to run a winning campaign. The book gets to the heart of what women need to know before running for office or as they are kicking off their candidacy for public office. Kathy Groob held Pink Politics speaking events in Bowling Green and Louisville Kentucky, Wisconsin, New York, California, Minnesota, Florida, West Virginia and several throughout Ohio. “I’m energized by the women I have met throughout the country who are interested in running for office themselves or helping others to run successfully. We’re building a movement with so many outstanding organizations and individuals dedicated to the cause. I am proud to be part of the national trend to elect more women to pubic office,” says Kathy Groob. PINK POLITICS does more than define proven campaign strategies. It offers stories about women candidates running for office at the local and national levels, and how they addressed challenges that all women candidates face. “PINK POLITICS offers women a comprehensive, practical guide to running for office and about challenges they will face before throwing their hat into the ring,” said Diane Whalen, Florence Kentucky mayor. Developing a strong grassroots effort and outworking your opponent! A 30+-year businesswoman and executive, Kathy Groob was elected to her hometown city council two times before running for the Kentucky Senate. Groob has become a powerful advocate for women in politics and has inspired hundreds of women to become involved in politics. She is the founder of ElectWomen.com and is a founding board member of The Women’s Network and co-founder of Emerge Kentucky, a women’s candidate training program. She conducts training programs and seminars for various groups and candidates. Kathy Groob resides in Covington Kentucky which ranks 38th in the U.S. for women in elective office. She and her husband provide political consulting and training through their business, November Strategies. For more information or to buy the book, visit www.electwomen.com or contact Kathy Groob at [email protected].